Santa Has Already Made It To Sloto’Cash With $100 Ticket! 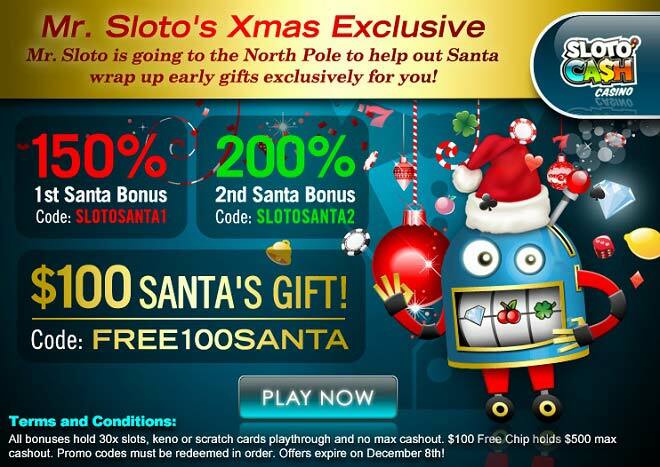 The holiday season is upon us once again and joy can surely be felt all over Sloto’Cash. When we think about this time of the year we think about how this is a time for giving – and on that note, Santa and Mr. Sloto have teamed up to give away tons of cash and bring you one heck of a jolly December! And what better way than to kickoff the most wonderful time of the year than by playing for a $100 FREE SANTA TICKET! Get ready to spin the reels for some Extras Xmas wins this December as you add a 150% match to your next deposit, followed by a 200% Match and top off your Xmas Tree with with $100 FREE TICKET!